"Location! Location! FIRST block of the Beach w/ AMAZING PANORAMIC OCEAN VIEWS!! Newly Built in 2017,offers all the bells and whistles! Spacious open floor plan with lots of indoor & outdoor spaces to entertain. Master suite with 2 addit'l nicely appointed BR'S, 2.5 BA. Upgraded High End Finishes throughout, white oak HW floors, La Cantina doors open to an expansive outdoor patio w/ beautiful ocean views. An Addit'l Private roof top deck with spectacular ocean views is an absolute oasis retreat"
"Completely renovated detached home across the street from the beach and in the center of town with Ocean Views, Exclusive Use Yard, 2 Car Garage and No HOA Dues! Interior upgrades include highly durable SPC flooring, quartz countertops, stainless steel appliances, completely renovated bathrooms, fresh paint and window treatments. 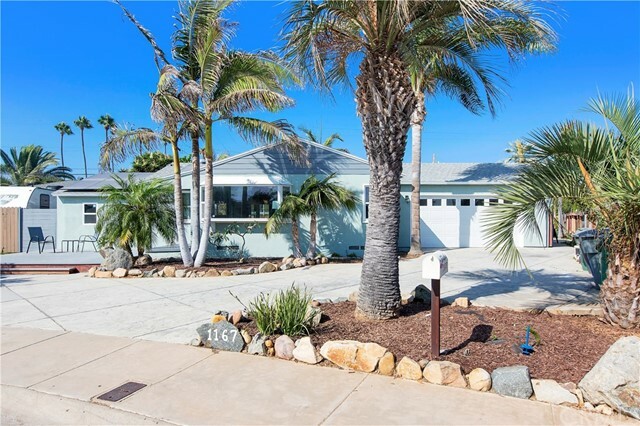 Exterior cement board siding was recently painted; and New double paned sliding doors, roof, stucco deck with rust resistant railings, fences & gates have just been ins"
"This home is a southern California dream home and is back on the market. Newly remodeled, with a spacious entry, updated kitchen, master bedroom with en suite and dual closets, and a 330 sqft casita over-looking the beautiful replastered pool, come make this home your live-in getaway. Boasting a 2.5 car, 671sqft garage with powder room, the handiest family member can work in the spacious work bench setting, with two cars parked inside the garage. One recent addition to the home is a large laundr"
"Resort style living at the beach! Surf the Pacific Ocean in your backyard or unwind with a hike through the Estuary. From your deck you will be able to sip on Margaritas and enjoy spectacular views of the Estuary, the hills of Mexico and the ocean! Every evening you can unwind as you gaze at the ever ending sunset....marking the end to another perfect day at your beach hideaway. Live the life you always dreamed of at Boca Rio.Imperial Beach is still touted as the most affordable beach front co"